Insert this multi-faceted Candelabra into your next celebration cake and add a shimmery shower of sparkles to the party. Reusable. Includes 9 candles. Measures 6.5 x 6 x 6 inches. 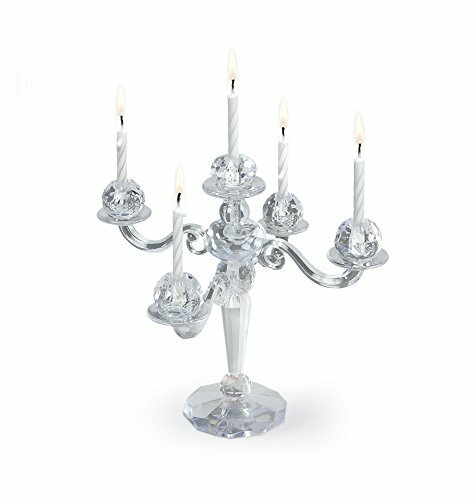 Insert this multi-faceted Candelabra into your next celebration cake and add a shimmery shower of sparkles to the party! This fancy and fun take on a formal 6-branch candelabra is crafted from clear, Lucite-like plastic and can be used over and over again. Perfect for parties, birthdays, weddings, bachelorette parties, christenings or other celebrations! If you have any questions about this product by Fancy That, contact us by completing and submitting the form below. If you are looking for a specif part number, please include it with your message.